The sign reads “Best tacos and burritos in LA!” and I think hmm maybe the hunt is over. Maybe my journey ends here on Fairfax Ave, in a place called Franks. I ordered the trifecta - asada, carnitas, adobada. In LA adobada and al pastor are pretty interchangeable. Most places that offer al pastor really serve adobada which is pork that is marinated and grilled instead of cooked on a rotating spit like real al pastor. Tacos were $1.35 each and they had cold bottles of lime jarritos. 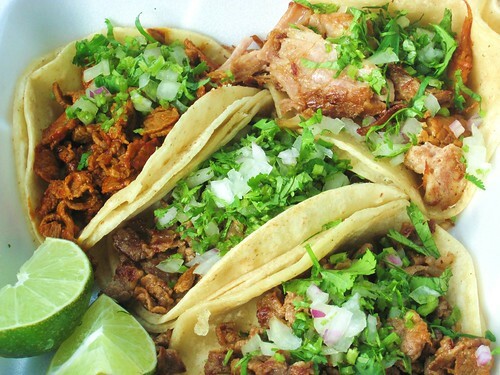 The adobada is the most interesting, the shaved pork is nicely spiced and flavorful. I prefer when places advertise their pork as adobado instead of al pastor. Al pastor should come off a rotating spit. If it’s marinated and grilled on a plancha just call it adobada. The carnitas is better than most carnitas I’ve had. Some parts were juicy, some crunchy and it had that cooked in it’s own fat flavor to it. One of the big hunks of salted pork practically melted in my mouth and went perfectly with the salsa verde. 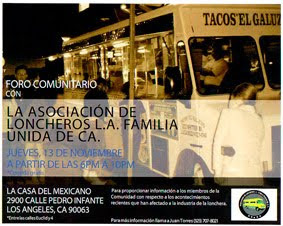 The tacos at Frank’s come with two salsas, a salsa roja which is a mild tomato salsa and spicy salsa verde. The tomato salsa doesn’t do much for me, ask for extra verde with your tacos if you like some spice. The carne asada was finely cut and didn’t have quite the flavor of the pork tacos. Most people think of carne asada as meat that is char grilled but most of what passes for carne asada at taco trucks and taquerias is cooked on a flat grill and is broken down on the grill. I’ve had some great asada tacos that didn’t have that char to them and I’ve had some really poor asada tacos. These asada tacos were somewhere in-between. Best tacos in LA? I don’t think so. Best tacos on Fairfax Ave? Possibly. 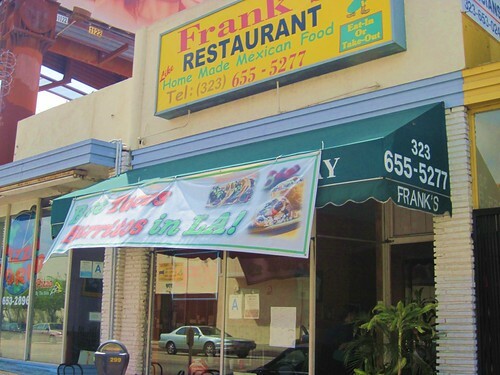 I’d certainly eat at Frank’s over Chipotle or any of the other Mexican eateries in the area. For best results skip the weak tomato salsa and ask for extra salsa verde. The salsa verde goes especially good with the carnitas. Whoa! This place is right up the block from my house! Thanks for the review. I will definitely try it as an alternative to the Farmers Market! great tacos, the best I ever had, the salsa is super spicy. that guy suarez is a bum. Frank Fridays is great. we love the carne asada burritos. Franks is great but everytime we order at work we end up having group hugs.